(15/P69) TRENTON – Responding to the growing need for support to fight Western wildfires, the Christie Administration is sending an additional 20 members of the New Jersey Forest Fire Service and New Jersey State Forestry Services to assist in the battling of wildfires that are raging across parts of the Northwest, Department of Environmental Protection Commissioner Bob Martin announced today. These members, who are expected to leave New Jersey over the weekend or early next week, will supplement 32 firefighters, including three wildfire truck crews, the Christie Administration dispatched more than week ago as part of a cooperative aid agreement with the U.S. Forest Service. The 20 members of the hand crew that left New Jersey Aug. 15 have been directly assisting the U.S. Forest Service in fighting wildfires in LoLo National Forest in Montana. 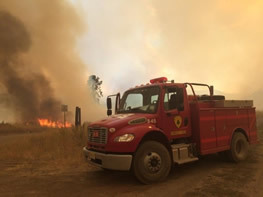 Immediately after arriving in Oregon Aug. 17, the three truck crews were assigned to fight wildfires in Washington State. 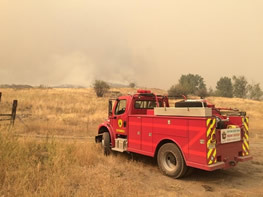 New Jersey’s firefighters are among nearly 30,000 firefighters from across the country battling fires raging across Idaho, Montana, Oregon, Washington and California. The U.S. Forest Service will be reimbursing the state for all costs associated with the deployment of crews to the fires in the Pacific Northwest. Personnel and equipment are being dispatched from across the state. The assignments will have no impacts on the ability of the Forest Fire Service to fight any wildfires in New Jersey. The New Jersey Forest Fire Service is responsible for protecting life and property from wildfires within more than three million acres across New Jersey. The New Jersey Forest Fire Service is one of the oldest organizations of its kind in the U.S., tracing its roots back to 1899, when Gifford Pinchot, a hired consultant, submitted a report to the State Geologist that emphasized the need for forest fire control and recommended the establishment of a forest fire service. Pinchot later became the first Chief of the U.S. Forest Service. In 1905, the Forest, Park and Reservation Commission was established and the first forest protection laws were enacted. The New Jersey Forest Fire Service was established the following year.